As the field of Enterprise Engagement gains momentum, I wanted to take a moment to remember one of the founders of this field who was lost on American Airlines flight 11 on September 11, 2001. Having run a large regional travel agency in the Northeast and created one of the early incentive travel companies, Richard was a well-known player in the field of incentives. 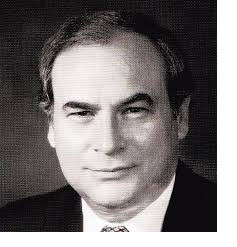 He was an early president of the Society of Incentive Travel Executives and highly active in the field in general. So it was somewhat surprising when, in the mid-1990s, he decided to sell his travel agency and related incentive firm and focus all of his efforts on new consulting firm he created in Boston known as the Ross Group. Why did he make this radical change? I happen to know because Richard hired my firm to help create his first sales and marketing materials. He was one of our first customers. It was our job to help him crystallize the message of his new firm. The first point he insisted on: the Ross Group was going to focus fully on “People Performance Management,” the term that pre-dated what we now call Enterprise Engagement. Why had that term arisen? Because a bunch of us in the incentive field felt that the focus on incentives was too narrow: that motivation was more complex than simply focusing on incentives. Richard had made the decision 20 years ago in 1996 that to truly motivate people to accomplish goals, or engage them as we now say, requires not only incentives, but the right combination of culture and brand values, communications, learning, rewards & recognition and other tactics organized into a formal program. In creating the materials for his new company, we spent two days coming up with a service offering that is very similar to what is now being offered by so-called “engagement agencies”: an analytical approach to helping organizations achieve specific goals that identifies those issues that have to be addressed and develops a program specifically designed to address those issues with clear objectives. Richard had made a good living creating memorable travel programs for customers all over the world, so I asked him, “Aren’t you going too far? There are no budgets for what you’re selling. Shouldn’t you ease your customers into this by selling incentive programs?” Richard would have nothing of it. He was intent on doing a complete remake, little knowing he was 20 years ahead of his time. He had just sold his travel agency business and felt he could make this commitment, especially because, as an owner of a multi-million-dollar company and founder of a charity to fight brain tumors (in addition to being involved with other not-for-profit activities), he had built a sizeable network of CEOs, some of whom, at least, he felt would understand the economics of his new firm’s approach. I kept in touch with Richard over the years and I gathered the business was a tough slog, but he didn’t give up. He was not considering any change of strategy when I last spoke with him. One of his business friends told me he was on his way to the west coast to begin planning for a program he had sold to a major food company on Sept. 11. It was, I was told, his dream account. The loss of Richard to his wife, children, family and community, is of course the greatest loss of all. That day, like no other in recent memory, shows how the loss of almost any life can reverberate across so many others. 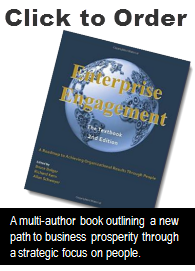 It’s also fair to say that the Enterprise Engagement Alliance’s efforts to develop this new enterprise-wide approach to engagement, what we at the time called People Performance Management, might have evolved much quicker had Richard lived on. His success with one major client would have led to success with another, and because of Richard’s stature in the field, others would have learned about his success. That of course, would have led to others catching on. I believe that the loss of that single life made the job of the EEA that much more difficult. We had no history of success stories to trumpet to convince others that Enterprise Engagement was more than marketing wordplay. Today, Richard would be astounded to see how far this field has come. He would not have dreamed that leading pension funds would be asking public companies to disclose their human capital investments, and even more narrowly, their practices related to employee engagement, incentives and learning. To even imagine that International Organization for Standardization (ISO) would consider creating standards related to employee engagement would have been unimaginable, all of this coming 20 years after he created the Ross Group. It’s very hard for companies to give up what they have sold for 50 years and what customers have comfortably purchased. The horse and buggy companies didn’t give birth to cars. Calculator companies did not evolve into personal computer giants. Richard’s story is proof that people coming from a traditional industry can innovate and lead the market in a new direction. The business from which Richard came indeed has many of the unique capabilities to profit from this new concept of engagement, because it’s as close as any entity in the engagement space to being able to provide a full-service solution. Evidence is increasing that some of these firms, at least, will rise to the occasion. Richard’s death also reminds us how much the efforts of one person, or the loss of that person, can have a ripple effect on the people around them without anyone even recognizing it at the time. Here’s to you, Mr. Ross.